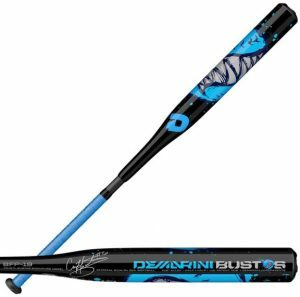 One of our favorite bats for an entry level fastpitch player is the 2019 DeMarini Bustos in a drop 13. We aren’t the only ones to have information about the Bustos. Other places, in particular those who sell bats, usually have a boiler plate write up on the specs of a bat. Many of those we reference to make sure we are seeing what we should be. Here are some more references for the 2019 DeMarini Bustos review. Our smaller hitters loved the ultra light swing weight and the smooth smash crated by the two piece design. It is hot out of the wrapper, doesn’t require any break in and delivers pop to be useful to the serious, albeit small, fastpitch player. More on this bat in our 2019 DeMarini Bustos Fastpitch Review. In so many ways the Drop 13 DeMarini Bustos Fastpitch bat is the perfect fit for the entry level fastpitch player. A drop 13 swings remarkably light–and with a 2 1/4 barrel you can expect as much bat speed as you can muster. This serves the smaller player well enough. The two piece design helps for hand sting and, in theory at least, increases aggression at the plate. However, don’t confuse this bat for a bigger hitter. We’d suggest anyone over the age of 11 look elsewhere. Even in the bats 32/19 it swings like a twig—and high pitch speeds could very well dent the aluminum barrel. If you are new to the fastpitch space, under the age 11, but here to take the game seriously (like maybe on your first travel team) then we think the 2019 Bustos a great fit and we highly recommend it. The only thing similar about the 2018 Proven from Slugger and the DeMarini Bustos is that they both swing light and they price out about the same. For most, either bat will likely do rather well for them. However, do note the single piece composite structure of the Proven will hurt on mishits more than the two piece Bustos. As well, you’ll need to work int he Proven with a few hundred hits to get it working at its top form. The 2019 Bustos is a two piece hybrid bat. That means the handle of the bat is made from a composite material while the barrel is made from aluminum. High end fastpitch bats are often made in the two piece design, but most of the high end ones use both a composite barrel and composite handle. (See the rare exception here). The Bustos comes in a drop 13. This means the numerical difference between the length of the bat in inches is 13 units away from the weight of the bat in ounces. In some sense, the drop helps determine the type of player who uses the bat. (But that is a very superficial understanding of how it works). To give you a point of reference, most collegiate players use a drop 8. High school players might use a drop 9, 10 or, occasionally, an 11. Drop 13’s are made for smaller players that need as much bat speed as possible. If you can’t find it in any of these sizes try a few different vendors that we link above.